Students from the Science, Technology, Engineering and Math (STEM) Center came out Thursday night to present some phenomenal projects at CCC’s annual Student Research Symposium. Contributions ranged from innovative design, like Ben Cain’s metal foundry and Christopher Babcock’s mocular skate system, to inventive research, like Albert Wong and Aaron Phan’s presentation on evolving bacterial DNA discovery techniques. Also impressive were the rockets built by a team of six students–Joshua Castro, Freddy Juarez, Hannah Moore, Vy Nguyen, Wesley Ortega and Lucas Silva–as part of NASA’s Minority University Research and Education Rising Data program. 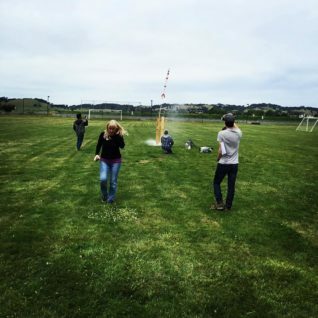 The Arduino-based payloads carried by these rockets contained sensors to measure flight motion and environmental temperature as the altitude changes. The symposium caps off a busy year of events for the STEM Center. If you’re interested in pursing a related field, be sure to contact them and ask how you can get involved.